OSAKA - Osaka Mayor Hirofumi Yoshimura will end Osaka’s six-decade sister city relationship with San Francisco after the mayor of the U.S. city, Edwin Lee, signed a resolution Wednesday that designates as city property a memorial to “comfort women” — women and girls who were forced to work in Japanese military brothels before and during World War II. “The sister city relationship of trust is gone. I’ll undertake measures to dissolve it,” Yoshimura said Thursday evening. The memorial, dedicated in September to the so-called comfort women, has been the subject of long-standing tensions between memorial supporters and the Osaka mayor. The Japanese government has also protested the memorial. Chief Cabinet Secretary Yoshihide Suga said it was in conflict with Japan’s position on the comfort women issue. Those who led the effort to establish the memorial welcomed Lee’s decision. “(Prime Minister Shinzo) Abe’s policy of denial of the comfort women history and fake news has been now defeated. Let the record stand that neither the San Francisco mayor nor the Board of Supervisors nor the citizens will be bullied by the Japanese government when it comes to protecting all women from sexual violence,” said Julie Tang, a retired judge who serves as co-chair of the Comfort Women Justice Coalition, one of the main groups behind the memorial, in a news statement. 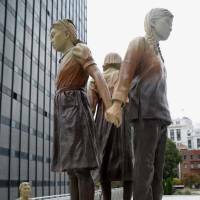 The San Francisco Board of Supervisors received dozens of complaints about the statue from local residents and Japanese who warned it misrepresented history and would harm bilateral relations. But a letter to San Francisco on Oct. 27, signed by nearly 200 people in Japan, supported the comfort women memorial becoming public property. 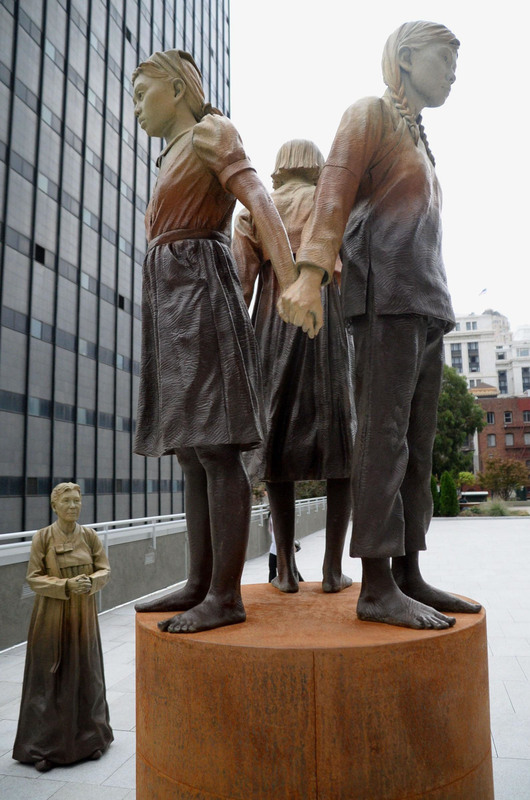 “When we received hundreds of letters of support for the comfort women memorial from Japanese citizens, in Osaka and beyond, we knew that the people of Japan disagree with their deluded leaders,” said Lillian Sing, who co-chairs the CWJC. Historians continue to debate the exact number of comfort women. All estimates remain problematic and the true figure is unlikely to ever be known. Concerned Yoshimura’s actions could harm the city’s image abroad as it bids for the 2025 World Expo, the Osaka city assembly chapters of the Liberal Democratic Party and Komeito petitioned the mayor Wednesday to solve the problem through continued dialogue with San Francisco. “The sister city relationship has been a source of wealth for Osaka, the city assembly and Osakans, nurtured by constant effort over many years. The activities of local governments must not affect diplomatic negotiations,” their request said, although many in the LDP chapter oppose the statue.